With the year 2019 starting to unfurl there has been a flurry of attacks on even the most basic religious beliefs. Thou Shall Not Kill, handed to us by our Judaic forebears, means nothing. Essentially, we are told by those in elective positions it is no longer operative. We view New Yorkers cheering on the sentencing to death of countless human victims – with the vigor of those in the Roman colosseums. Are we mandated to take action on behalf of today's victims? Beyond pinching ourselves to realize this is actually the real world, as Christians can imagine almost 2 millennia ago our Master stumbling along the Via Dolorosa, emaciated body bleeding, while carrying that heavy wooden cross. 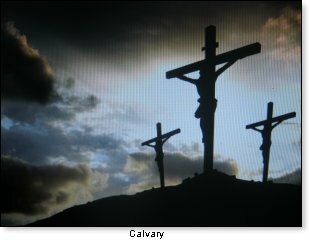 Would we have fled when they hung Him on the cross? But beyond that, would we identify with Him, or cheer on the ruler who ordered His death! Who was the one who ordered the death of the man carrying that cross back then? The Roman procurator, Pontius Pilate. And the man carrying the cross and destined to die? Yeshua, the Nazarene, the one who claimed he was God incarnate. Is there anything in any way resembling that scenario playing out in our world today? Sadly, there is. The protagonists on stage in New York are real people, and the issue in focus centers on life and death. Worse still, however, is the cheering and celebration at the prospect of innocents being sent to their death. Think about it: absolutely sinless HUMAN beings! Who is the Pontius Pilate of our day? Can we also say that he is inspired by the same force which drove leaders of that biblical empire where our Master was sent to His death on that bleak day? It does appear to be exactly the same, because today's ruler seems to have the same venom in his actions that Pontius Pilate had. This man's name is Andrew Cuomo, and he serves as the governor of a territory known as New York State in a country known as the United States of America. 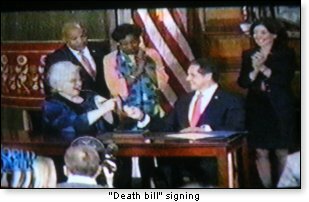 Pontius Pilate Cuomo, as he should be known, signed into law a "Reproductive Health Care Act," which de-criminalizes the willful destruction of newly-created human beings umbilically attached to a female member of what is still known as the "human family." The affixing of his signature to this legal document was highly celebratory, producing great elation with much arm waving, hugs and kisses – both around the table on stage and all throughout the auditorium and gallery. Only members of this "human family" are capable of displaying such glee. It was captured on TV, and it has to rank as one of the most pitiful days in this country's history. To punctuate the event, Cuomo selected Jan. 22nd, the anniversary date of the Roe v Wade Supreme Court decision, which is responsible for the deaths of over 60 million children who have been denied the right to see the light of day in this nation. He then had the World Trade Tower illuminated in pink to magnify the celebration of what he had done. This tower has been built on the piece of land which on Sept 11, 2001 cost close to 3000 men, women and children lost their lives to fanatical terrorists. Those responsible for planning these deaths claimed they were doing so in the name of God. 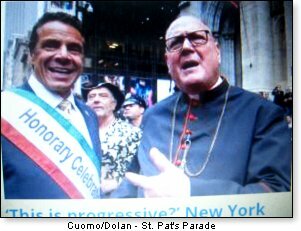 Governor Andrew Cuomo purports to be a practicing member of the Roman Catholic religion. The ironies are extensive in this scenario. The lead protagonist, however, although not at the signing event in Albany, is one Timothy Dolan, Cardinal Archbishop of the Archdiocese of New York. He displays timidity by not reflecting the actions of the Master who, whip in hand, tossed over the tables of the money-changers desecrating Solomon's temple in ancient Israel. The Cardinal has been outspoken, referring to that Albany stage scene as "ghoulish, grisly and gruesome," but essentially is saying, "You may still say you are Roman Catholic." "And you may continue to cite the Pope as your inspiration for the way you practice the Faith." Rather, Pontius Pilate Cuomo should have been forthrightly told, "You have excommunicated yourself from our belief system by these despicable acts." "The scandal is going to end." Believers have to admonish the Cardinal to position himself on the southern part of Manhattan Island, looking north toward that tower and visualize it as a cross – not lit up in pink – but red with the blood of the Master hanging limp, arms outstretched. Lifting his eyes beyond that cross at the magnificence of the sky with soft clouds seemingly drifting further north to Albany, the words from the Good Book, "Admonish the sinner" should be reverberating. Evil is contagious and can eventually become a plague. 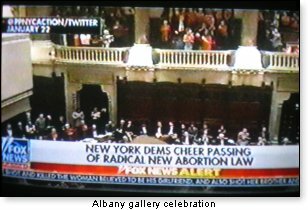 The Albany, New York celebration of death already has. Virginia's Governor, a pediatric neurologist, commented on a bill which would "resuscitate" a child expelled from the womb after an abortion. The child, we are told, would be made "comfortable" after expulsion, pending discussion between the physician and mother. Without enumerating the next steps, he self-righteously said he favored at least 2 physicians being involved. Cardinal Dolan, have you noticed that God's law, on which this nation was built is never the criterion. Have you forgotten, also, that medical practitioners and politicians are being elevated to God-like status. All the while, once-respected religious leaders are now being scorned. The Roman Catholic Church has enormous problems emanating from the scandal which has arisen out of the homosexual subculture that developed in the priestly ranks, and then moved up into the hierarchy. They have not been acting similar to so-called "princes," and these labels of royalty should be discarded. Pharisaical hypocrisy would be more accurate. Time for change! The Rev. Franklin Graham is being looked upon with esteem for his willingness not to bow before the political element. He, to his great credit, has stepped forward after the diabolical actions of New York's Gov. Cuomo to admonish Cardinal Dolan to take public action. The aroused laity in the ranks applauded Rev. Graham – and it may be a final call to action for Roman Catholic Church officials. The Laity are far ahead of those who are supposed to be the leaders. Anyone who has ever looked into the eyes of one who deals in deadly acts can perceive that very same look in the eyes of New York's Governor. His face – full of rage- reflects that same countenance. It's demonic. He is sick! Worse still, perhaps is that the scandalous spread that we have seen of this current Cuomo mentality has become so evident throughout these now "Divided" States of America. The expulsion of a newly-created child through contractions is God's plan. Our part – none excluded – is to assist in nurturing His beautiful, exquisite creation. Making the child "comfortable" is the first step – but only the first step. Life is still our first enumerated right in America – and the Founders clearly stated it has been endowed by OUR CREATOR. Your words have been eloquent – but words are just words. Action is now the call because they have not been heeded by the one who holds enormous power by his position to prevent the destruction of countless human lives. The scandal resulting from the public's interpretation of the signing of the perversely-named "Reproductive Health" Act on Jan. 22, 2019 has dictated that those responsible be formally excommunicated from the Roman Catholic Church. The bleeding must be stopped. 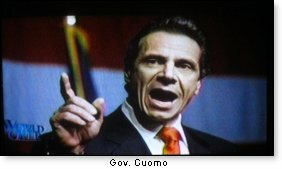 Governor Cuomo's defiance of the Church has even been misinterpreted by many as placing the de-criminalization of infanticide as the morally correct stance. Legality and morality are often confused. Other souls are placed at risk by scandalous repercussions – now palpably spreading across the country. One state's bill specifically assigns no legal rights whatsoever to a child prior to birth. In other words, these Godly creations are legal non-entities. Cardinal Dolan, beware of false pride. "Put not your faith in princes," we have been admonished. We want to hear from you: "I serve the Prince of Peace, not the Prince of Darkness." You must rise above the verbal fray. You are the titular head of the Roman Catholic Church in the governmental territory, over which Andrew Cuomo presides. Let him cite polls and receive plaudits, but you must always remember, "The rebuke of a wise man is better than the praise of a fool." You have to display by your act of excommunication of the Governor that you are that "wise man." In reality, it is very much for his benefit, as well. He, as all of us, is comprised of body and soul. His soul is in serious danger, and your obligation is to take this action as a Prelate in the Church to which he claims to belong. 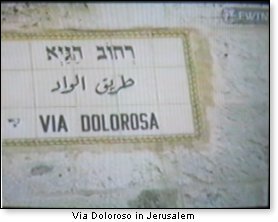 While not a perfect overlay, many of the moral dimensions along the Via Dolorosa that led to Calvary are present on the American scene today. First and foremost, of course, is the issue of life and death. The cross looms large in our lives, not because of the concept of "resuscitation" of which the one governor spoke about a child expelled from a womb, but because of the "Resurrection" of the One who died on that Calvary cross. The meeting in Rome Feb. 21 to 24 of leaders of the Roman Catholic Church at the Vatican will be pre-destined to be an utter failure for your leadership, if you have not excommunicated New York Governor Andrew Cuomo prior to your departure. The Body of Christ is made up of all the believers who practice His teaching in their lives. Those such as you, who profess to be their religious leaders, can never sanction in any way members in representative political positions who sanction – and worse promote – the destruction of innocent, defenseless human beings. To do otherwise is sheer hypocrisy. "Thou shall not kill" means exactly that. "Satan, get behind me," said the Master. You, too, must say the same to the Governor. He is the politician, you are the Church leader, and this must be made clear to all who diligently practice the Faith which you represent. By his excommunication, the brazen celebratory, death-dealing acts and actions of NY's Governor Andrew Cuomo will be shown for what they are. Unalterably – they shall not be tolerated. "I now go to the Vatican in Rome with a clear conscience, and I am truly the voice of those who live the Faith daily, abide by the Word – and believe in Life Eternal."..... Amen.